Joy referenced the #weneeddiversebooks movement a few posts back, when she talked about two black ballerinas, one fictional and one actual. In some ways, A Time to Dance could have been included in that post: it’s a book about a dancer who is also a person of color. But in other, critical ways, this entirely different, and not only because it’s a novel in verse and getting way more critical acclaim. This isn’t perfect, but it definitely beats out those other dance books we’ve seen this year and the other novel in verse I’ve read so far (with the caveats that Brown Girl Dreaming is next to read, and I don’t consider How I Discovered Poetry a novel). Everything Leads to You has all the elements you would want in a YA summer book: love, glamour, and mystery all in the warm, sunny climate of Southern California. And that’s just the trailer. 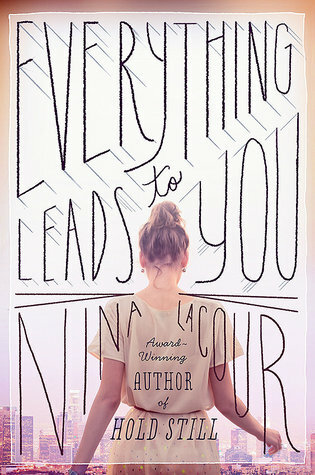 Nina LaCour’s latest novel is also a tender story that beautifully captures what it’s like to be a young dreamer on the edge of adulthood. There are a couple of pertinent details that are left out from these descriptions though. I wouldn’t blame you if you didn’t know that Emi, the protagonist, is a teen lesbian with African-American heritage (from her grandfather on her mother’s side); a glance at the cover or the flap copy won’t reveal any hint of these key facts. The book seems deliberately presented as white hetero-normative. So, I’ve thought about this almost as much as I’ve thought about the content of the novel and I’m still not sure how I feel. However, while I continue to let my ideas simmer, let’s talk about the meat. For the first formal writeup of the season, I thought I’d tackle the first likely contender I read (I read this one in late 2013, so I was early). Also, I know lots of people are itching to talk about it. Now, I like intricately plotted books that work seamlessly when I read them but leave me thinking about the author’s skill in putting all the bits together once I’ve finished reading. I also like mysteries and unreliable narrators. In other words, We Were Liars was made for me — but that’s not what makes it a worthy contender.